A favorite among foodies is fresh mozzarella with tomatoes and basil, dubbed an “Insalata Caprese” or Caprese Salad for its Italian roots in Capri. Although less pricey than the original’s buffalo milk mozzarella, fresh mozzarella made from cow’s milk is still a luxury item when you’re eating on a budget. And, like many types of cheese, it has a relatively high fat to protein ratio. So, this poor man’s version substitutes cottage cheese and serves it up on crackers or bread. This still has that light, fresh taste, but it’s higher in protein and lower in fat, even if you use full-fat cottage cheese. You can use any bread or cracker as the base; I used a thin rice cake for this gluten free version, but it would be great with a rye crispbread or sliced baguette, too. This makes a great snack or light meal. I think I’d like it with tomato soup, too, despite the redundancy. Spread 2-3 Tbsp cottage cheese on each cracker. 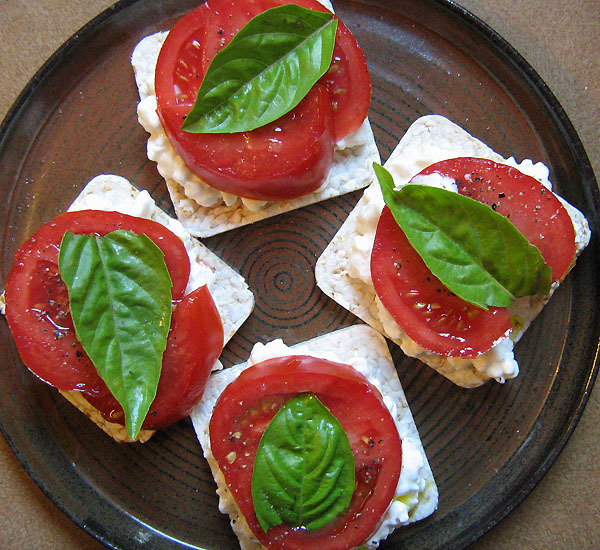 Top with tomato slice, a drizzle of EVOO, salt, pepper and basil leaf. Nosh & enjoy. Cost: about $2.50 with a half-pound organic tomato. This entry was posted in Five minute food and tagged $3 or less, dinner, gluten free, lunch, ovo-lacto vegetarian, vegetables by cookbookmaven. Bookmark the permalink.